Here, trailblazer, Chris Dilworth from HEINEKEN tells us why he felt it was important to start engaging with schools, and describes the unique methods he uses. What first made you decide to engage with schools? I felt that engineering apprenticeships weren’t getting the attention they should in schools, and this was a way to readdress that. Also, sometimes I think the perception amongst young people is that engineers 'wear dirty overalls and hit things with a hammer', and I wanted to change this perception! We thought pupils needed hear more about the apprenticeship options available to them so they didn’t miss out, but also this was also a good way for us to open ourselves up to local talent. As well as this, we also felt that we could help develop pupils’ skills and give them experiences that they wouldn’t be able to get in their usually activity. So it was also a way we could actively support the local community. It was really a question of calling the schools and asking! We contacted a number of schools local to our premises in Manchester, and asked if they wanted us to visit. You work for HEINEKEN – which area in particular? I’m the Training Manager at the HEINEKEN Manchester brewery. We brew and package a number of HEINEKEN UK’s key brands. This is not about our products though; our interest is in recruiting engineering apprentices who are involved with the development and maintenance of our equipment and machinery. What form do your visits to schools take exactly? We get involved in a range of ways. We support career evenings and skills development sessions. These might revolve around presentation skills or, when it comes to Year 11s, interview skills. 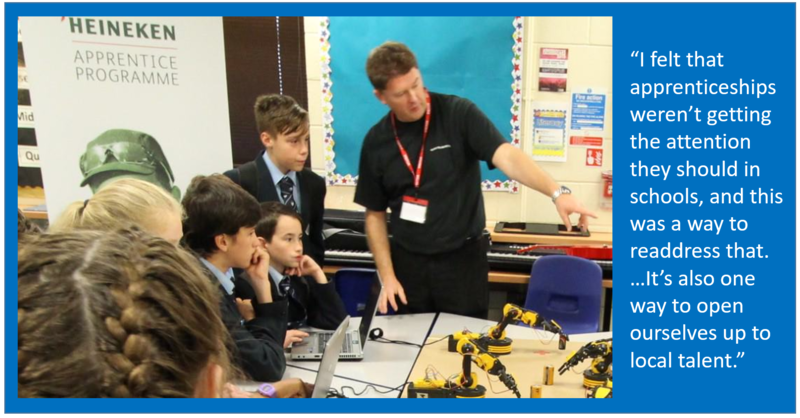 We also hold specific day events revolving around project work, or STEM subjects. HEINEKEN is a highly responsible business, and works hard to ensure that our brands are not marketed to those under the legal drinking age. How do you get the pupils’ attention? We make things fun. For instance we might involve a ‘What’s My Line’ type of interactive game, where pupils have to guess our jobs by asking questions that could only be answered with a ‘yes’ or ‘no’. Or we might revolve our STEM days around robots, and what their role is in our industry. Sometimes we bring in bits of equipment such as pumps, valves and motors, so we can teach them about them and let them experience them first hand. As part of an ongoing project, we donated a bike to one school so that the pupils could understand the working principles of the bike’s components and how these might fail. The pupils were taught about maintenance and developed standards to keep the bike in optimum condition. We also give pupils details about the apprentice options available to them and the qualifications they’ll need. Do your own apprentices get involved? 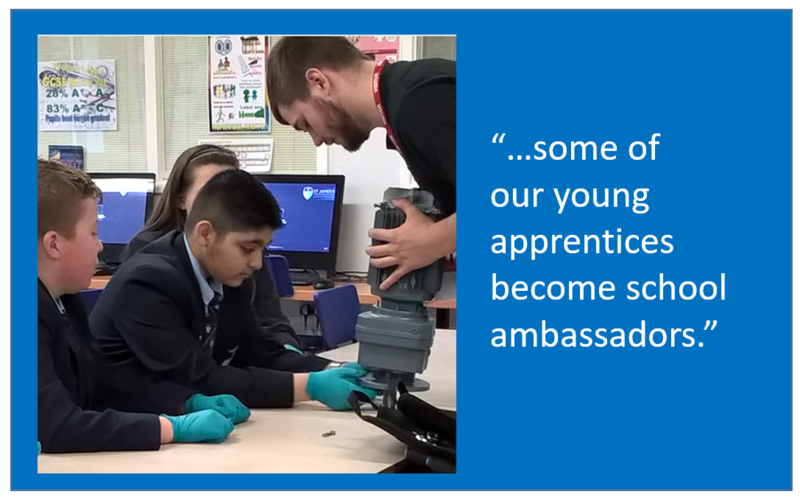 Yes, some of our young apprentices become ‘school ambassadors’. They go out to schools, give presentations, run projects and interact with the pupils. This has an added advantage because, as a by-product, the process helps to develop their own skills as well as those of the pupils! 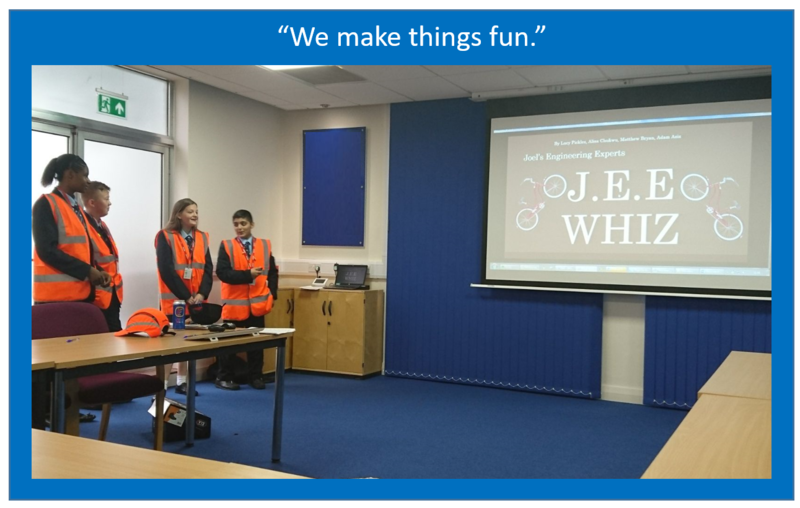 Afterwards you will often see a massive improvement in our apprentices’ presentation skills and general confidence. It’s quite astounding. Some also attend the two-day training course run by the National Skills Academy for Food and Drink where they get training in how to present and be a schools ambassador. You mention ‘not missing out on talent’ – have you ever talent spotted at one of these engagements? Yes, not long ago one pupil massively stood out when doing interview skills training. I was impressed with him, and recommended that he apply to us, which he did. He is now one of our apprentices and doing very well. Are you worried that young people in general aren’t being given enough information about apprenticeships? Yes – often when we ask pupils from Year 10 & 11 what they know about apprenticeships nobody puts up hands. They only seem to have information surrounding the college or university options. I suspect that some teachers and parents actively steer pupils away from apprenticeships. Why do you think they aren’t presented as a credible option in the same way that colleges and universities are? I think that historically this route has been viewed as the option aimed at young people who are less able and have low aspirations. But this is completely untrue, and I make sure I let teachers know this. I also happily offer teachers information regarding the salaries that will await those who follow this route. When I do so, the shock on the teachers’ faces is visible – it’s always quite a jaw dropping moment. I also make sure the teachers know all about the qualifications needed, and the opportunities available. I do my best to ensure that pupils won’t automatically discount the apprentice route before they have looked into of the types of option available to them. As a brewer, how do you ensure that visits to schools are managed responsibly? This work with schools is not about promoting our products, it’s about raising awareness of engineering apprenticeships and developing pupils’ interest in this area. Across UK there is a massive shortfall of engineers. This is only going to get worse, for there are more leaving the profession via retirement than coming in. Would you recommend other business and industries engage with schools about apprenticeships in their area? Yes – it’s a perfect way for business to help ensure that local youngsters don’t miss out on opportunities - and that they don’t miss out on local talent. Plus, if you involve your own apprentices you can help them build up their softer skills which can be extremely beneficial to them throughout their careers. It’s really a win win for everyone involved. Find out what happened when Harvey Coulson from HEINEKEN became a schools ambassador.